I spent last weekend in San Diego at TNNA, the trade show for our industry. Three committee member of the Masters Program joined me, Celia McAdam Cahill, Carla Pera and Christina Hanger. We visited all of the booths to look at new products. Starting with the Summer issue of Cast On, we will no longer be reviewing new products in the magazine. The publication lag time is just too great. Instead, we will be releasing a video in February with interview of various vendors showcasing the products which excited us. It was ton of fun. Things are picking up after the holidays. I received several lessons while I was out of town. Since I've spend the better part of the day trying to help locate a Masters Program submission which is MIA I'd like to ask all of my students to send me an email with a tracking number when you send me a package. UPS and USPS include the tracking number on receipts. It is much easier to find a package if you know it is missing immediately! I try to remember to include the tracking information in the email with the review letter. If I do not, remind me! This week's tip is inspired by a question sent to TKGA. Someone wanted to know if we had a course on the problems with circular knitting. I had to stop and think. I'm not used to thinking there are problems with circular knitting except for avoiding jogs in Fair Isle. Sometimes I get so caught up in minutiae of techniques I forget what it was like when I first started knitting. So...this weeks topic is about casting on in the round. I'll cover other issues with circular knitting in upcoming weeks. One problem thing that can occur if you are using too long of a circular needle and you are not familiar with the Magic Loop method. The cast on can be quite tight until the first row is worked. If the cord is long it can be difficult to stretch the stitches from the tip of one needle to the next. You can use the Magic Loop method or work the first few rows on DPNs. If you look at any pattern worked in the round and the first instruction will ALWAYS be "Join into a round taking care not to twist the sts" or something similar. Anyone who has ever twisted the cast on row knows why this is the case. The photo below shows what a twisted cast on looks like after you have worked a couple of rounds. I have done this more times than I like to admit. Yes, you can flip the needle around but you will have to bring the working yarn under the cast on edge which really detracts from its general appearance and can impact how much the cast on edge can stretch. It also is just plain ugly. If you look closely you can see where the edge is twisted (plus there is a big red arrow marking it.) It is pretty subtle on the first row where you only have a few strands of yarn. This is why most of us don't notice it until the second round. Whenever you are working in the round, check your cast on edge very carefully before you join in the round. If you don't and you discover this later, the best solution is to start over. I've actually fixed this before but it isn't something I will ever do again. It distorts the tension too much. Here is what your cast on should look like before you join. 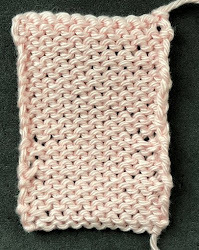 The other issue is how you join the last cast on stitch to the first to avoid a wide space between the two stitches. The three most common ways to do this is to just knit the first stitch taking care to pull the working yarn quite tight. The yarn tail can be used to neaten up the edge when the project is complete. I took an informal survey a few years ago of the members of the Masters Committee and this was the method most used, including Carolyn Vance, who I like to refer to as The Mitten Queen (Carolyn's Ravelry Project Page). She knits a lot of mittens and she knows a few things about knitting in the round. Here is the video where I discuss this and how to avoid twisting the stitches: Circular Knitting Cast On. Salon will be on January 17th from 1:30 to 3:30. I finally finished up the knee highs. I must have ripped them out five times. The challenge with knee highs is shaping the calf. I wanted the shaping to fit in with the stitch pattern. Here is what I finally came up with. The dental elastics show where I made increases. I haven't written the pattern yet so I need them! Here is the finished sock. The foot on the form isn't really foot size, hence the bunching. This color is much more accurate. The yarn is Miss Babs Hot Shot. There is a short pair to go with the pattern as well. Here they are. The Confident Beginner pattern is for skinny scarves (4.5-5" wide). There are three. I used simple lace patterns that are easiest enough for even new knitters. Here are close ups of the stitch patterns. Are you sensing a trend in the color palette for this issue? This yarn is Madelinetosh Silk Merino. Just two more things to go. I am knitting a dress and a lacy overdress, I'm using Anzula Breeze doubled for the dress. Here is how far along I am with the dress. I'm doing a tubular cast on.